Our newest classic pro golf season is COMING SOON: travel back a couple decades and re-live golf's late 20th century glory with the 1994 Pro Season for HISTORY MAKER GOLF Championship Golf Game! NOW AVAILABLE! Forty-four events made up the '94 tour, with six of them won by the year's top money-winner and players open champion, Nick Price. For Price, it was his second championship in three years. He also won the British open championship in '94, one of a select few golfers to win back-to-back majors the same year. Named player-of-the-year, '94 was the peak of Price's Hall-of-Fame career. Plenty of stars are included in this card set along with the player of the year, Price! He won two of the year's four majors, while the other two were won by Ernie Els of South Africa and Spaniard Jose Maria Olazabal (Masters). (1994 remains the only year in which an American golfer did not win at least one of the four major tournaments when all four were held.) For Olazabal, it was the first of two Masters Green Jackets, earned largely with a 35-foot eagle putt on the 15th hole that gave him a three-stroke lead over Tom Lehman. Els was one of ten golfers won their first-ever tournaments in '94. Els' first (full) year on the tour was highlighted by his playoff win at the US open, where he hung on to defeat Colin Montgomerie and Loren Roberts on a memorably tough final round at Oakmont. That performance and a season of solid play earned Els Rookie of the Year honors. Among the other first-time tour winners in '94 was Dicky Pride. Pride made headlines in the final round in Memphis, where he sank a long clutch putt on 18 to lift himself into a three-way tie with tourney co-leaders Gene Sauers and Hal Sutton, then went on to win on to defeat them both with a birdie putt on the first playoff hole. Speaking of Hal Sutton—the '94 season was a watershed year for the veteran golfer, he was named comeback player of the year. Sutton had won the players championship in early 1983, followed later that year by the pro championship. But he then fell on tough times, going seven full years without a tour win. With his tour status about to be revoked, he used a one-time-only exemption to keep playing! Notable as well was Greg Norman's win the Players Championship, paced by a 9-under 63 on the first round on his way to a blazing 24-under for the four rounds, four strokes ahead of Fuzzy Zoeller. Every golfer who had a top ten finish in '94 is carded for this set, as are many who did not, over 150 golfers in all. Each golfer's card, from those at the top of the money list to those who often missed the cut, is studiously crafted to re-create his real-life golf game on your tabletop. Long-distance drivers like Price and Norman will get that extra length from the tee, while guys like Corey Pavin will sometimes frustrate you by coming up short. Solid pros like Lehman and Jeff Maggert will consistently set themselves up for birdie opportunities with accurate shots from the tee box, while Ben Crenshaw and Brad Bryant will often be blasting out from the rough. Bill Glasson and Bob Estes will be among your most effective with an iron, while Fred Funk and Payne Stewart—not so much. Pros like Mark McCumber and David Frost will get your adrenaline going with consistent sinking of clutch putts, while the putting struggles of guys like Tom Kite and John Cook will leave you shaking your head. Every aspect of every golfer's game is captured, it'll feel like you're watching the real-life '94 golf season on TV, or from a front-row seat in the gallery! 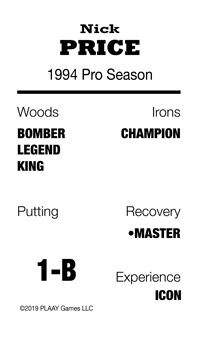 Pro golf's biggest (and lesser) stars re-live their 1994 fortunes with the 1994 Pro Season cards for HISTORY MAKER GOLF! Match play, stroke play, skins games, short-form tournaments, or even a full-season of pro events—it's up to you! Or, just enjoy an informal, leisurely round of golf, "caddying" for your favorite '90s golf star on one of HMG's many available pro courses. However you choose to play, we're sure you'll have a great time. The 1994 Pro Season for HISTORY MAKER GOLF Championship Golf Board Game includes over 150 of the year's top golfers and sells for $19 postage paid. Order YOUR copy!